Flash array supplier use. Click to kick a larger pic onto your screen. What do we see? Violin trounces everybody else in the number of installed arrays and in-pilot/budget-agreed-for-use categories. But the percentage of flash array use amongst the surveyed users is low; just 17 vendors are listed but not one has a greater than 5 per cent in-use status, with most having less than 2 per cent. Amongst TheInfoPro survey base, Skyera, Pure Storage, Nimbus Data, Kaminario and HP are basically nowhere. The top four are Violin and EMC, followed by Cisco/Whiptail, with IBM/TMS in fourth place. 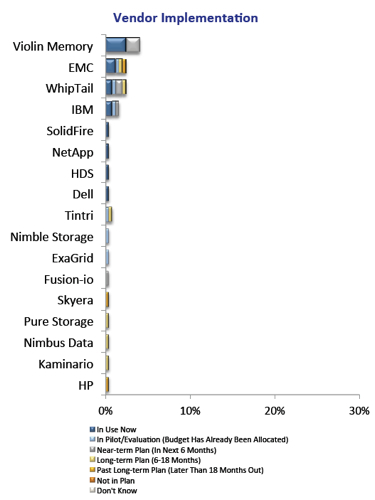 Solidfire, NetApp, HDS and Dell follow in descending order. El Reg's very own Manky Quadragon flash array supplier ranking matches this ranking, generally speaking. So we'll give them a thumbs-up, for now.